The AQ6150B Series Optical Wavelength Meter is an ideal instrument for accurately measuring the optical wavelength of optical devices and systems with wavelength ranges from 900 nm to 1700 nm. 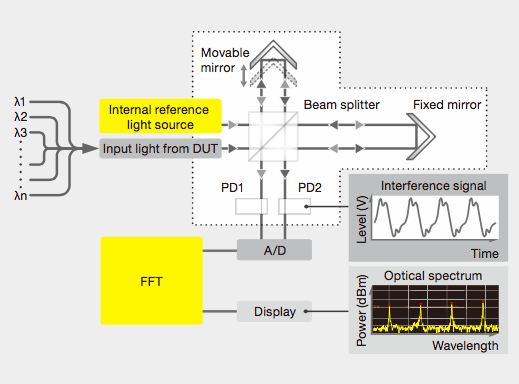 By employing a Michelson interferometer and a high speed Fast Fourier Transform (FFT) algorithm, the AQ6150 series can measure not only a single wavelength laser signal, but also a multiple wavelength laser signal from a DWDM system and Fabry-Perot laser. Furthermore, this technology enables the measurement of modulated laser signals in addition to the CW signal from an optical transceiver. The optimized optical design and data processing routine significantly reduces the measurement time and improves manufacturing throughput. There are two models in this series. The High Accuracy AQ6151B model offers an accuracy of ±0.2 ppm to meet the most demanding precision requirements. The Standard Accuracy AQ6150B offers a ±0.7 ppm accuracy for applications with less demanding requirements, at a more affordable price. The real time correction feature utilizes a highly stable reference signal from the built-in wavelength reference light source in order to provide long-term stability for each and every measurement taken. The optical output of optical transceivers and optical transmission systems is modulated with a transmission frequency including 10 G and 25 Gbps. The built-In Optical Spectrum Analysis capability utilizing an FFT technique is required to measure the spectrum broadened by the modulated signal. In addition to the regular CW light mode, the AQ6150 Series has a modulated light mode. The modulated mode analyzes the optical spectrum and discovers the center wavelength of the modulated light. This mode can also be used for the center wavelength measurement of optical filters such as a band pass filter, AWG and WSS. AQ6150 series can measure up to 1024 wavelengths in a single input signal with a minimum separation of 5 GHz simultaneously, quickly, and accurately. This means it can meet testing needs in the development and production of WDM transmission system today and in the future as well. The multi-wavelength measurement capability contributes to production efficiency and cost reduction in the production of single-wavelength laser devices as well, by combining multiple laser modules or optical transceivers using an optical coupler and measuring all the signals at once. Equipped with an Auto Gain Control (AGC) function, the AQ6150 Series adjusts the gain of the electrical amplifier automatically based on the input signal power. This helps maximize wavelength accuracy and measurement speed even if the input signal power is as low as −40 dBm. 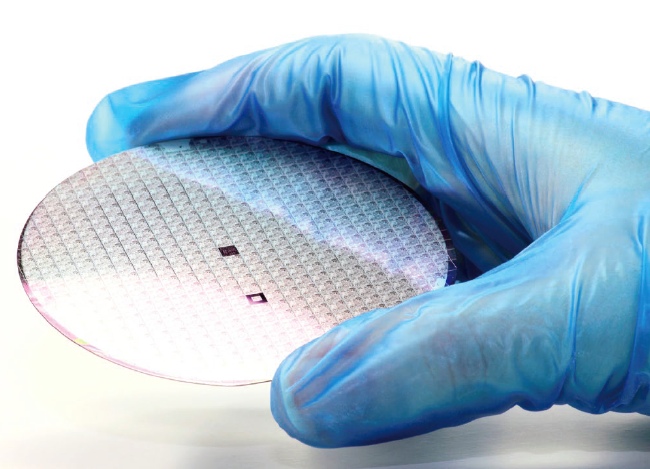 For the adjustment and characterization of tunable laser sources and tunable optical transceivers requiring hundreds of wavelength measurements per device, high-speed measurement and processing capability are crucial for improving the production throughput. 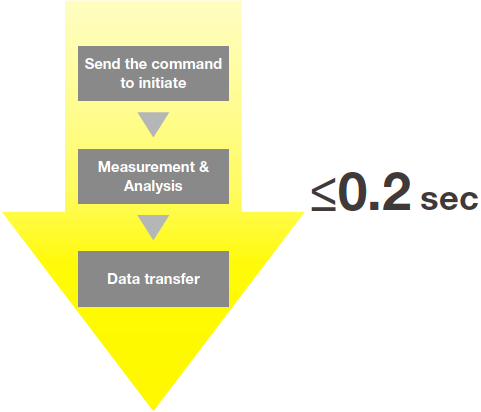 Both models can acquire, analyze and transfer a measurement to a PC in less than 0.2 seconds! This is 2 times faster than our AQ6150 or AQ6151 model, thus vastly improving production throughput. In the Repeat measurement mode, the AQ6150 series can collect 10 measurements per second, making it extremely useful when adjusting a device while monitoring the wavelength in real time. Easily build an automated measurement system using a remote control interface, ETHERNET or GP-IB. The remote command set complies with the commonly accepted SCPI industry standard command set for programmable instruments. Thus, the existing measurement system can be easily upgraded without having to change the measurement program if Yokogawa AQ6140 series or another SCPI compatible optical wavelength meter is already in use. 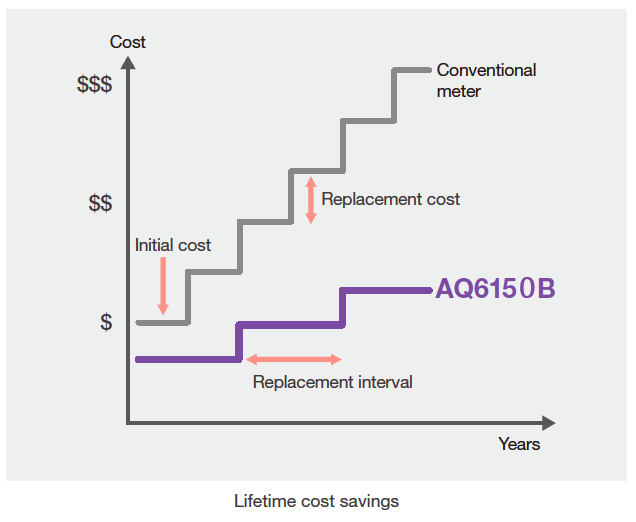 With the conventional wavelength meters, the high failure rate of the wavelength reference light source and its high replacement costs have been a major contribution to the overall costs of ownership during the product life cycle, not to mention the costs generated by the downtime itself. One of our key targets for product design was to address and mitigate as much as possible these issues. We achieved this goal in a multi-dimensional approach as represented graphically in the below scheme. Extending the typical lifetime (MTBF) of the light source (Maximize Horizontal scale). Reducing the replacement cost (Minimize Vertical scale). For USB compatible data storage devices. mouse, and keyboard. File function enables users to save data and screenshots to the internal memory or USB storage to use when creating test reports. Screenshots can also be saved by simply pressing the Print Screen button (PRT SCN) located on the front panel. 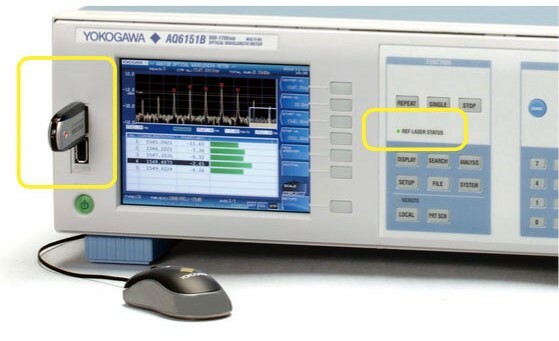 The AQ6150 series screen design and intuitive is inherited from Yokogawa's best- selling optical spectrum analyzer. This interface has been proven by a vast population of users on a global scale in areas such as R&D testing and troubleshooting in manufacturing. The standard LAN port allows convenient access to files stored in the internal memory as well as the ability to remotely update the firmware from a PC. Using a USB mouse makes it easy and intuitive to change measurement conditions, execute an analysis, and modify the optical spectrum view. 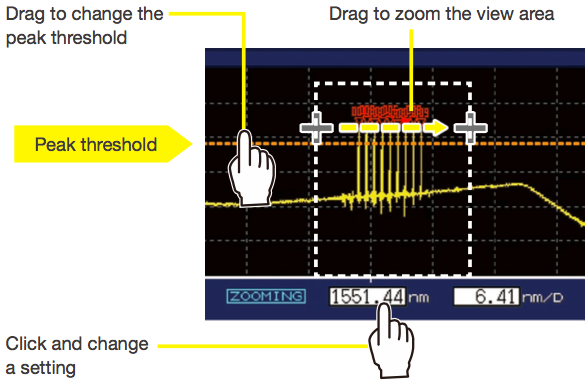 In the optical spectrum view, the waveform view area can be zoomed and shifted by a simple click and drag. The peak threshold line, threshold for peak detection, can also be moved in the same manner. 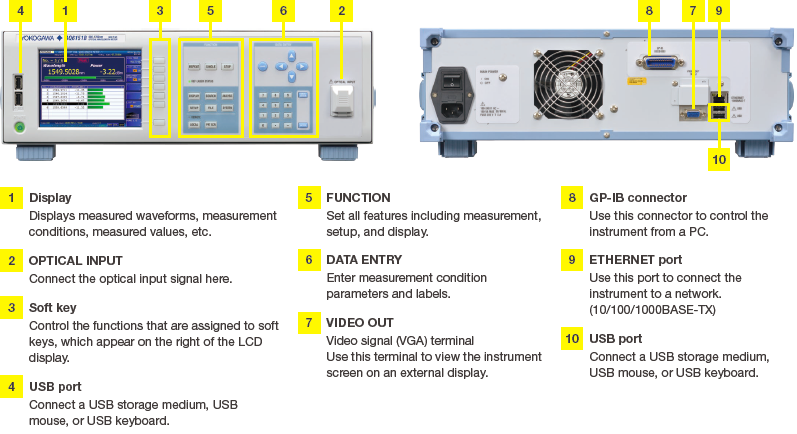 Display Single wavelength, multi-wavelength, delta, grid, spectrum, wavelength axis units, optical power units, center wavelength, total power, marker, label, power bar, warning messages, error messages, system information. The single wavelength mode displays the wavelength and power of the highest peak or an arbitrary peak using large easy to read numbers. This allows the values to be easily read even if the unit is placed at the top of the test stand. 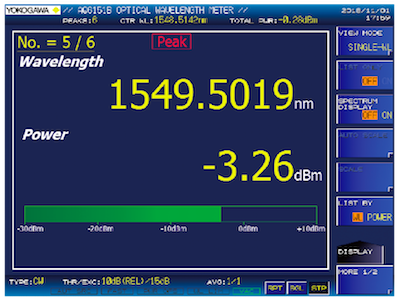 The multi wavelength mode displays a list of wavelengths and power of multiple peaks with the wavelength and power of the highest peak or an arbitrary peak on top of the list. There is also a mode to show the list only to maximize the number of channels shown on the screen. The delta wavelength mode calculates and displays the difference between a reference peak and the other peaks in terms of wavelength and power. This mode helps determine the peak spacing. Choose from any of the following measurement units. The AQ6150 series can display an optical spectrum waveform obtained from a Fast Fourier Transform (FFT) algorithm. It allows for determining test conditions and for troubleshooting an error in the measurement while confirming the actual spectrum. When a peak is selected on the list, the peak automatically shifts to the center of the optical spectrum view, making viewing easy and convenient. The AQ6150 series is equipped with automatic measurement and analysis functions. These functions save valuable time and resources from creating/validating remote control and analysis programs. 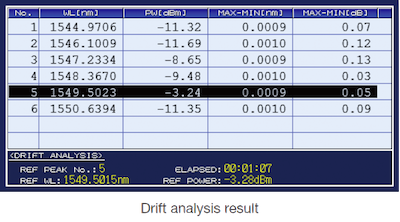 The evaluation parameters of a Fabry-Perot laser can be analyzed and displayed instantly from the measured optical spectrum. 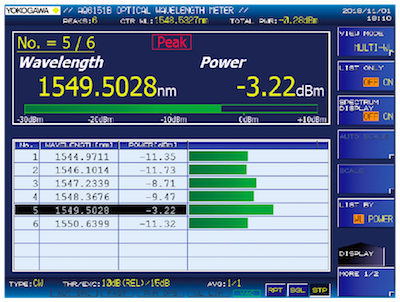 Results include: Center wavelength, total power, spectral-width (FWHM), mode spacing, etc. The average measurement obtains an average wavelength and power for each peak by repeating the measurement. This function helps reduce uncertainty of measurement for a modulated signal or unstable signals. 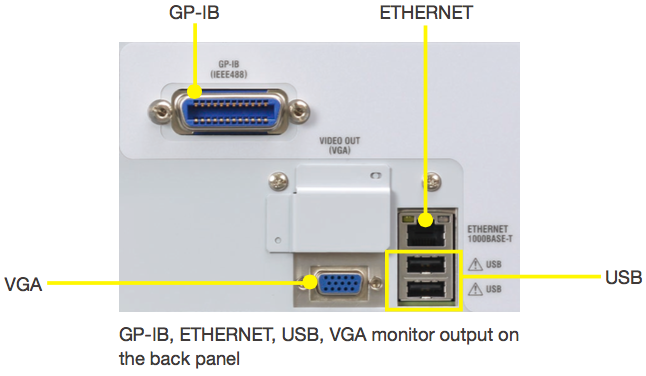 Up to 100001 points of measurement data per channel can be stored and displayed in tabular or graph form. It facilitates the long-term stability test and temperature cycle test. In order to meet the rigorous demands of current and next generation communication networks, developers are constantly challenged to improve the efficiency and capacity of the transmission system. In response to these challenges, various techniques have been developed, such as minimizing channel spacing, maximizing the number of channels and transmission rate, using sophisticated modulation schemes, etc. Calibration of DFB lasers for optical amplifier test system. Calibration of tunable lasers for passive component test systems. 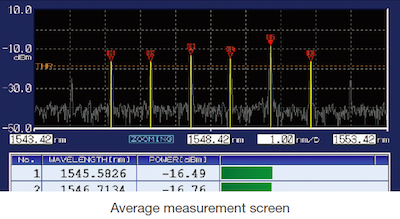 Modulated signal measurement of optical transceivers and transponders. Measurement of all channels of 40 G and 100 G optical transceivers with WDM technology. Generate interference by changing the optical path length difference between the fixed mirror and the movable mirror. Then detect the interference signal with the optical receiver. 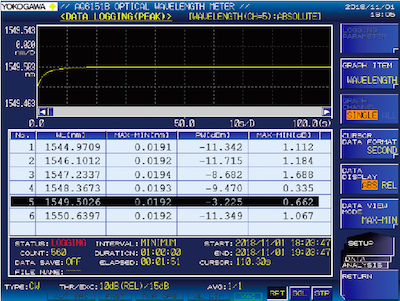 Convert the interference signal (interferogram) into the optical spectrum waveform. 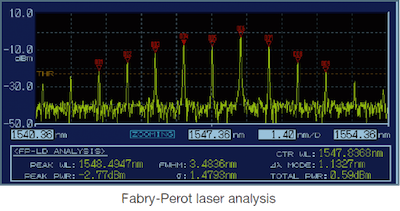 Analyze the given optical spectrum waveform. Then output the wavelength and power data of the input signal. Correct the measurement error by simultaneously measuring the interference signal of the reference wavelength while measuring the input signal.